Jotika 9016 Nelson’s Navy HM Gunboat William 1/32 scale wood ship kit! Double plank on bulkhead construction in lime and walnut; all decking in high quality maple strip ; 1x24pdr cast bronze cannon complete with integral trunnion bar, reinforcing rings, gun lock and Kings Monogram; walnut 24pdr cannon carriage and rotating platform; 2x12pdr carronades complete with integral trunnion bar, reinforcing rings, sights, touch hole, training handle and brech ring; walnut carronade carriage and sliding bed; gunnery equipment including rammers, sponges, ladle and worm; Cast bronze stve and chimney with hatch and hinge detailing; 3cast bronze buckets with individual ‘slat’ detailing of the planks bound by two iron straps;highly detailed brass etched components; precision CNC cut and profiled walnut and ply components; all required blocks, black & natural hemp to rig the model as shown; high quality birch dowel for the masting; fully detailed actual scale plan sheets and two comprehensive step by step colour instruction manuals including technical drawings and constructional photos of the prototype. Purchased by the Royal Navy in 1795, William, under the direction of Sir Sidney Smith, was fitted as a hoy rigged gunboat at Plymouth Yard. As fitted, William was armed with 1x24pdr cannon, 2x12pdr carronades and a compliment of 25 men. Of special interest is the innovative design of an early form of turret mounting for the 24pdr cannon. The cannon and carriage were mounted onto a bed which in turn sat on a bearing race made up of cannon balls, allowing the whole assembly to rotate on the flat (camber less) forecastle. Although capable of sail, with a fore-and-aft style hoy rig, William would have been more commonly rowed. This is further illustrated not only by the evidence of rowlocks and oars but by the way the mast is mounted on a pivot allowing it to be rotated down to deck, extending aft, guided by the fore and aft mast carlings. 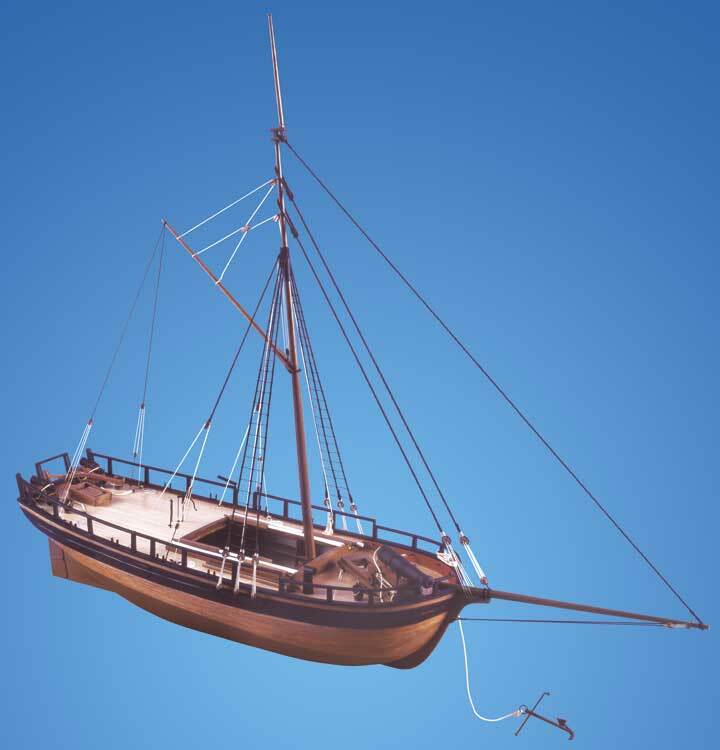 The mast would have been lowered in this manner in order to lower the centre of gravity and reduce resistance making the boat far more manoeuvrable by oar power. Built for anti-invasion duties, William was manned by 25 men. These men would usually be members of the ‘Sea Fencible’, the maritime equivalent of the Militia and volunteers. Although unclear, William is believed to have been wrecked in Guernsey Roads on 4th November 1801.